New, higher payout marks third straight year railroad products maker has increased dividend. The board of directors of railroad products manufacturer Wabtec (NYSE:WAB) was busy yesterday, announcing it was increasing its quarterly dividend payment by 60% while simultaneously splitting the company's stock. The board said it was raising the payout from $0.025 per share to $0.04 per share on Aug. 30 for shareholders of record as of Aug. 16. This marks the third consecutive year Wabtec has increased the dividend. The stock split, which will be paid June 11 to shareholders of record June 3, would be a 100% stock dividend and shareholders would receive one additional share of Wabtec's stock for each share they own on the record date. It expects the stock to begin trading at the split-adjusted price on June 12. The new dividend payment equates to a $0.16-per-share annual dividend yielding 0.1% based on the closing price of Wabtec's stock on May 14. 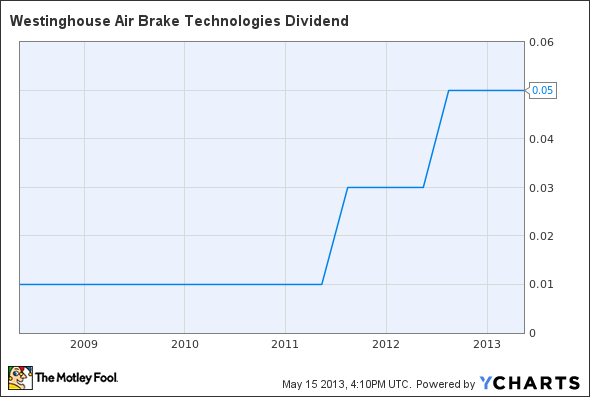 WAB Dividend data by YCharts.Chart does not reflect new, higher payment.